Why Do Egg Yolks Turn Green? Have you ever had a hard boiled egg that had a green yolk or a yolk with a green to gray ring around it? Here's a look at the chemistry behind why this happens. The green ring forms when you overheat the egg, causing hydrogen and sulfur in the egg white to react and form hydrogen sulfide gas. The hydrogen sulfide reacts with iron in the egg yolk to form a grayish-green compound (ferrous sulfide or iron sulfide) where the white and yolk meet. While the color isn't particularly appetizing, it's fine to eat. You can keep the yolk from turning green by only cooking the eggs long enough to harden them and then chilling the eggs as soon as they have finished cooking. One way to do this is by running cold water over the hot eggs as soon as the cooking time has elapsed. Start with room temperature eggs. This doesn't affect the yolk as much, but it does help prevent cracking the egg shells during cooking. Leaving the eggs on the counter about 15 minutes before cooking them usually does the trick. Place the eggs in a pot or saucepan in a single layer. Choose a pot that is just large enough to hold the eggs. Don't stack the eggs! Add enough cold water to cover the eggs, plus an inch more. Cover the eggs and quickly bring them to a boil using medium-high heat. Don't slow-cook the eggs or you'll risk overcooking them. Once the water boils, turn off the heat. Keep the eggs in the covered pot for 12 minutes for medium eggs or 15 minutes for large eggs. Run cold water over the eggs or place them in ice water. This cools the eggs quickly and stops the cooking process. 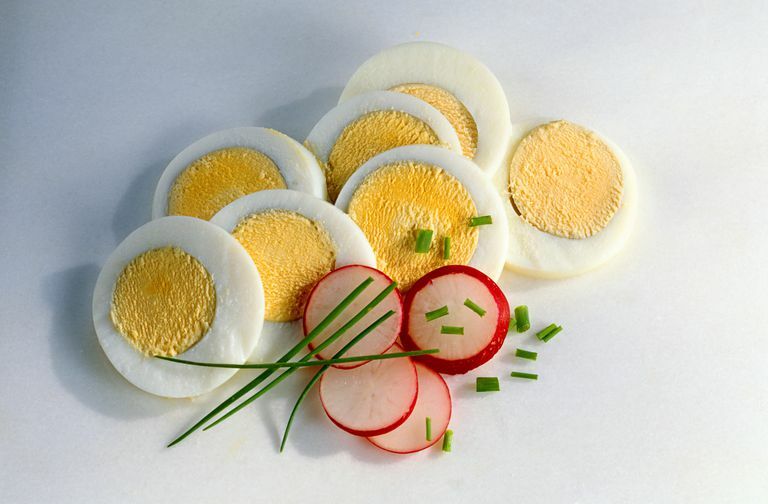 Cooking a hard boiled egg is a bit trickier at high altitude because the boiling point of water is a lower temperature. You'll need to cook the eggs a bit longer. Again, you'll get the best results if the eggs are close to room temperature before you cook them. Place the eggs in a single layer in a pot and cover them with an inch of cold water. Cover the eggs and heat the pot until the water boils. Remove the pot from heat and let the eggs rest, covered, for 20 minutes. Cool the eggs in ice water to stop the cooking process. The green or gray of an egg yolk is usually an unintentional chemical reaction, but it's also possible to change the color of an egg yolk on purpose. One way to control yolk color is to change the diet of the poultry. Another way is to inject a fat-soluble dye into the yolk. Are Raw Egg Whites a Legitimate Burn Remedy?